NASA's Curiosity Mars rover today completes its second Martian year since landing inside Gale Crater nearly four Earth years ago, which means it has recorded environmental patterns through two full cycles of Martian seasons. The repetition helps distinguish seasonal effects from sporadic events. For example, a large spike in methane in the local atmosphere during the first southern-hemisphere autumn in Gale Crater was not repeated the second autumn. It was an episodic release, still unexplained. However, the rover's measurements do suggest that much subtler changes in the background methane concentration -- amounts much less than during the spike -- may follow a seasonal pattern. Measurements of temperature, pressure, ultraviolet light reaching the surface and the scant water vapor in the air at Gale Crater show strong, repeated seasonal changes. "Curiosity's weather station has made measurements nearly every hour of every day, more than 34 million so far," said Curiosity Project Scientist Ashwin Vasavada of NASA's Jet Propulsion Laboratory, Pasadena, California. "The duration is important, because it's the second time through the seasons that lets us see repeated patterns." Each Martian year -- the time it takes the Red Planet to orbit the sun once -- lasts 687 Earth days. Curiosity landed on Aug. 5, 2012, (Pacific Time; Aug. 6, Universal Time). It begins its third Martian year on May 11, 2016, during the mission's 1,337th Martian day, or "sol," since landing. Each Martian sol lasts about 39.6 minutes longer than an Earth day, and a Martian year lasts 668.6 sols. The similar tilts of Earth and Mars give both planets a yearly rhythm of seasons. But some differences are great, such as in comparisons between day and night temperatures. Even during the time of the Martian year when temperatures at Gale Crater rise above freezing during the day, they plummet overnight below minus 130 F (minus 90 C), due to the thin atmosphere. Also, the more-elliptical orbit of Mars, compared to Earth, exaggerates the southern-hemisphere seasons, making them dominant even at Gale Crater's near-equatorial location. 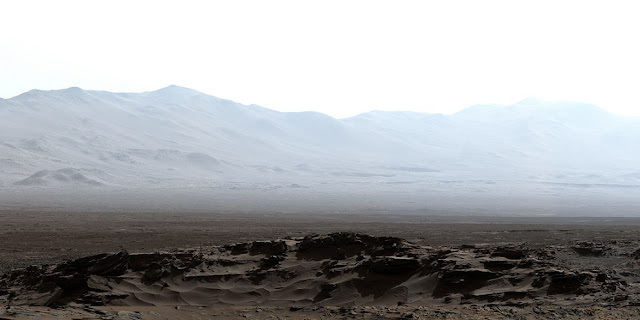 "Mars is much drier than our planet, and in particular Gale Crater, near the equator, is a very dry place on Mars," said Germán Martínez, a Curiosity science-team collaborator from Spain at the University of Michigan, Ann Arbor. "The water vapor content is a thousand to 10 thousand times less than on Earth." Curiosity's air-pressure measurements confirm a strong seasonal trend previously seen by other missions. "There are large changes due to the capture and release of carbon dioxide by the seasonal polar caps," Martínez explained. Most of the Martian atmosphere is carbon dioxide. During each pole's winter, millions of tons of this gas freeze solid, only to be released again in spring, prompting very un-Earthlike seasonal variations of about 25 percent in atmospheric pressure. Other seasonal patterns measured by Curiosity and repeated in the rover's second Martian year are that the local atmosphere is clear in winter, dustier in spring and summer, and windy in autumn. Visibility in Gale Crater is as low as 20 miles (30 kilometers) in summer, and as high as 80 miles (130 kilometers) in winter. For tracking changes in the concentration of methane in the air above Gale Crater, researchers use the tunable laser spectrometer in Curiosity's Sample Analysis at Mars (SAM) suite of instruments. These measurements are made less often than REMS measurements, though frequently enough to tease out seasonal patterns. For most of the two Martian years, the rover has measured methane concentrations between 0.3 and 0.8 parts per billion. For several weeks during the first autumn, the level spiked, reaching 7 parts per billion. The mission checked carefully for a repeat of that spike during the second autumn, but concentrations stayed at lower background levels. "Doing a second year told us right away that the spike was not a seasonal effect," said JPL's Chris Webster of the SAM team. "It's apparently an episodic event that we may or may not ever see again." However, the mission is continuing to monitor a possible seasonal pattern in the background methane concentration. The background level is far less than the spike level, but it appears to be even lower in autumn than in other seasons. If this pattern is confirmed, it may be related to the pressure pattern measured by REMS or to seasonal change in ultraviolet radiation, which is measured by REMS in concert with the rover's Mast Camera. "This shows not only the importance of long-term monitoring, but also the importance of combining more than one type of measurement from a single platform," Webster said. Check out the holes rocks punched in the wheels on the NASA website. They had better avoid them in the future. One wheel fractures, and the rest will soon follow from overloading. It will be something if Musk can land one of his SpaceX capsules on Mars in 2018.